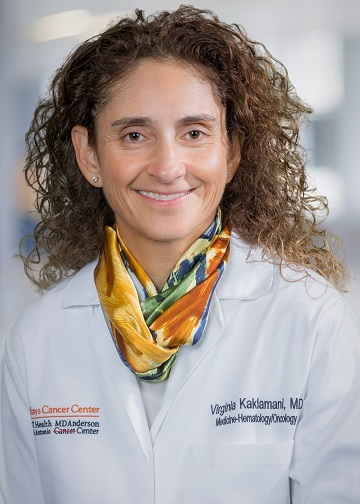 Dr. Virginia G. Kaklamani is a professor of medicine in the division of hematology/oncology at UT Health San Antonio and is the leader of the Breast Cancer Program at UT Health San Antonio MD Anderson Cancer Center. Dr. Kaklamani completed her medical training with honors at the University of Athens and her residency in internal medicine at Newton-Wellesley Hospital in Boston. She completed her fellowship in hematology/oncology at Northwestern University. She also received a master of science degree in clinical investigation from Northwestern University. She was head of the Translational Breast Cancer Program at Northwestern University and co-director of Northwestern's cancer genetics program. Her research interests include studying high-risk families and identifying genetic mutations that are associated with an increased risk for breast, colon and prostate cancer. She has identified several genetic mutations related to obesity that increase the risk of breast cancer. Dr. Kaklamani is a clinical investigator with expertise in designing clinical trials with targeted agents. Waisbren J., Uthe R., Siziopikou K., Kaklamani V. BRCA 1/2 gene mutation and gastrointestinal stromal tumours: a potential association. BMJ Case Rep. 2015 Jul 6;2015. pii: bcr2014208830. doi: 10.1136/bcr-2014-208830. PubMed PMID: 26150619. Kaklamani V.G., Jeruss J.S., Hughes E., Siziopikou K., Timms K.M., Gutin A., Abkevich V., Sangale Z., Solimeno C., Brown K.L., Jones J., Hartman A.R., Meservey C., Jovanovic B., Helenowski I., Khan S.A., Bethke K., Hansen N., Uthe R., Giordano S., Rosen S., Hoskins K., Von Roenn J., Jain S., Parini V., Gradishar W. Phase II neoadjuvant clinical trial of carboplatin and eribulin in women with triple negative early-stage breast cancer (NCT01372579). Breast Cancer Res Treat. 2015 Jun;151(3):629-38. doi: 10.1007/s10549-015-3435-y. Epub 2015 May 26. PubMed PMID: 26006067. Daly M.B., Pilarski R., Axilbund J.E., Buys S.S., Crawford B., Friedman S., Garber J.E., Horton C., Kaklamani V., Klein C., Kohlmann W., Kurian A., Litton J., Madlensky L., Marcom P.K., Merajver S.D., Offit K., Pal T., Pasche B., Reiser G., Shannon K.M., Swisher E., Voian N.C., Weitzel J.N., Whelan A., Wiesner G.L., Dwyer M.A., Kumar R.; National comprehensive cancer network. Genetic/familial high-risk assessment: breast and ovarian, version 1.2014. J Natl Compr Canc Netw. 2014 Sep;12(9):1326-38. PubMed PMID: 25190698. AACR Guest Blog: How Do We Overcome Endocrine Therapy Resistance in Breast Cancers?